Hawaiian Mimosas – this easy cocktail recipe has just three ingredients and will make you think you’re on a beach in paradise. 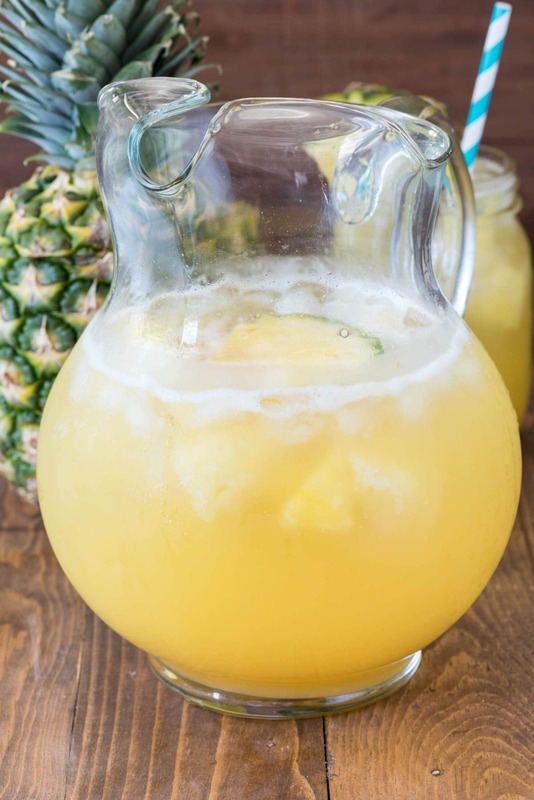 Pineapple, Rum, and Champagne is all it takes to make this delicious cocktail! Make it for one or make it for a party in a pitcher – they’re easy to make either way! Last year our trip was just as fun, but different since it wasn’t all new. And right smack dab in the middle of our trip, my husband got a work call that changed our lives (long story short: a bunch of people got let go and the company culture started going downhill, and he eventually changed jobs). Because of his new job he doesn’t have very much vacation time so Hawaii has to wait for us…which I get and understand but as we get closer to June I am craving my spot at the pool watching Jordan swim while I drink mimosas. Before our first trip to Hawaii, I’d never thought to use pineapple juice in a mimosa. In fact, I never really liked mimosas because I don’t love orange juice. Not worth the calories, I’d think, just gimme a big glass of champs….until I tried a PINEAPPLE Mimosa, that is. You guys: pineapple mimosas are Life. Changing. Pineapple juice and prosecco have taken up permanent residence in my house since I first tried them. Plain old bubbles + pineapple is great but recently I got smart and added Malibu Rum. There aren’t even any words. These Hawaiian Mimosas have only three ingredients and EVERYONE loves them. I’m calling them a Hawaiian Mimosa because every sip reminds me of my favorite place: Kaanapali Beach at the Marriott Beach Club in Maui. I highly recommend going there, renting a cabana, and ordering tropical drinks all day long. And since MIMOASAS are for breakfast, you have no reason not to start at 8am. You’re welcome. Hawaiian Mimosas are the perfect cocktail to remind you of summer, full of pineapple and coconut and champagne! ENJOY these Hawaiian Mimosas my friends! Bring a little beach to your backyard for brunch this weekend! Hawaiian Mimosas - this easy cocktail recipe has just three ingredients and will make you think you're on a beach in paradise. 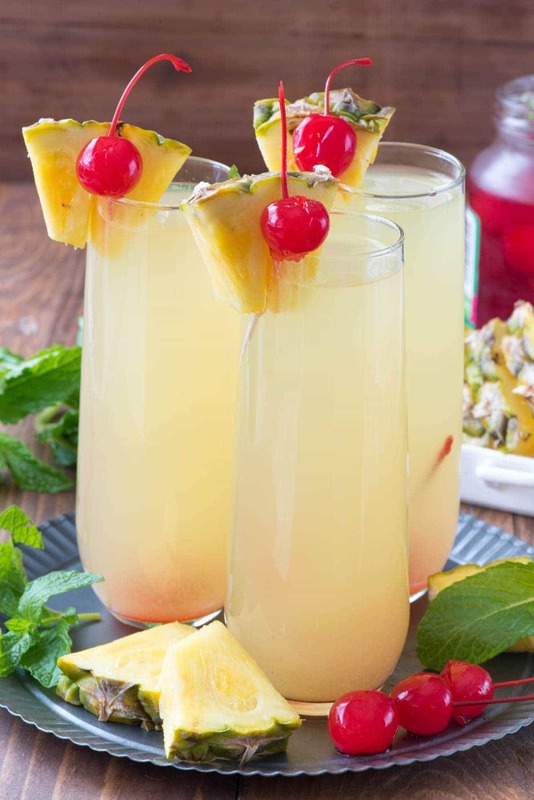 Pineapple, Rum, and Champagne is all it takes to make this delicious cocktail! 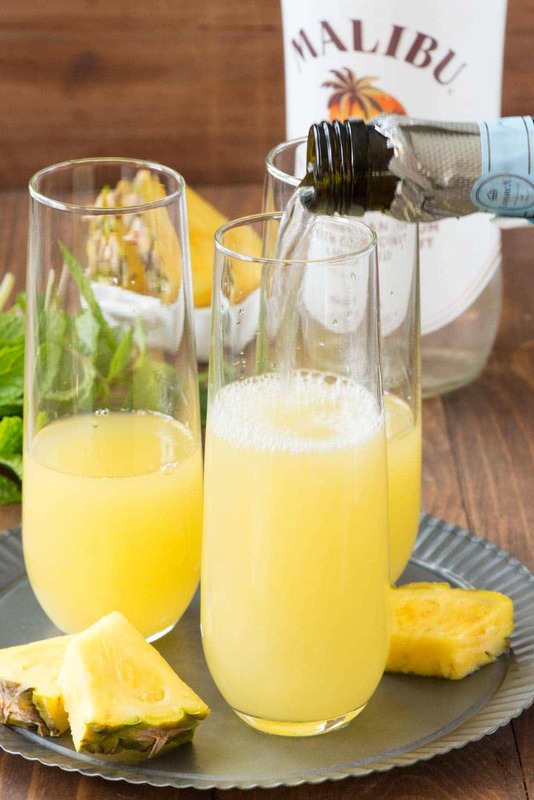 Per mimosa: add one ounce coconut rum and two ounces pineapple juice to a champagne glass. Top with champagne and garnish with pineapple and/or cherry. 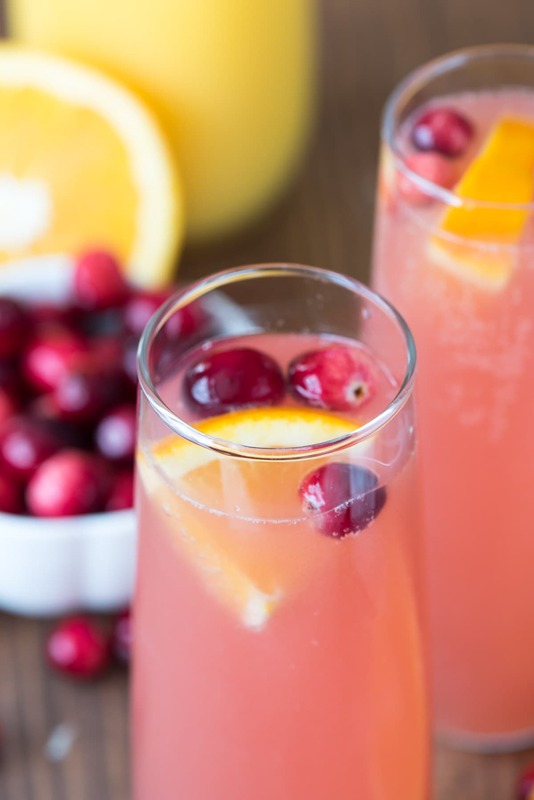 If you love champagne cocktails, try Lemonade Prosecco Punch, Raspberry Punch Bellinis, Orange Sorbet Mimosa, Pineapple Peach Mimosa, or Mexican Mimosas. Oh wow I need to try these! Such a brilliant combo! Thanks for the recipe, we are gonna try it this weekend! I have been to the exact hotel and beach in Hawaii just once and am dying to go back. I now have a cousin that lives on the big island of Hawaii and my husband and I talk frequently about moving there. Paradise! Hi…do u recommend an alternative instead of prosecco plz? What a fantastic cocktail! This is exactly the one I would have after a very long day – like Monday! You have inspired me to create something like that – thank you so much and salut! Hi Dorothy! Stopped by to say you have an amazing blog! and this recipe is the one that brought me to you from Pinterest! We had our annual ladies weekend on Mother’s Day in Altantic City and I made this. The ladies lived it. We going back in November and I’m going to make it again. Great cocktail! Made for my husband’s birthday this morning, a pitcher. Can’t go small on a birthday. Lol. I was in Hawaii years ago and the pineapple is what brings back memories, I certainly ate my fair share. No, I didn’t, but you can bet I’m going to this weekend! I’ll let you know how long they last?? 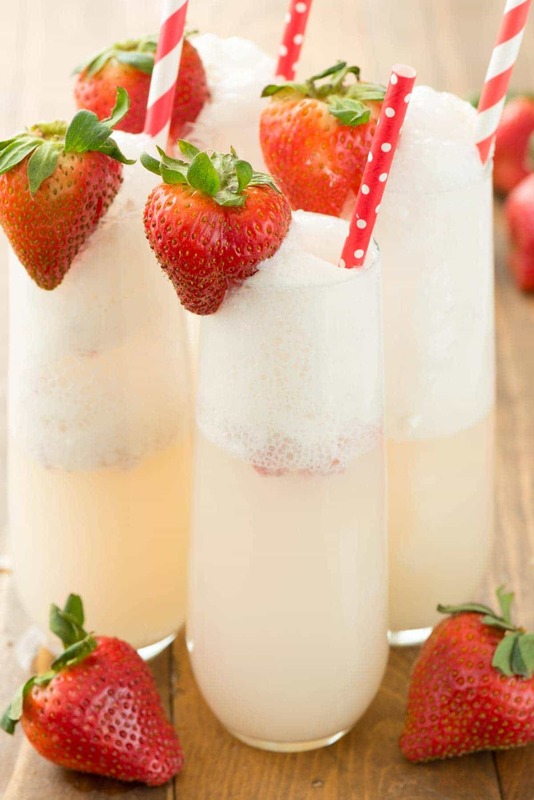 I love champagne and I love pina coladas and this was a super easy refreshing drink! It was a hit! Everyone loved them!! This looks delicious! Which would taste better Champagne or Prosecco? I know Champagne is always more citrus-y. First beach weekend of the season and my friend and I were looking for something new. These are amazing, even in the afternoon!